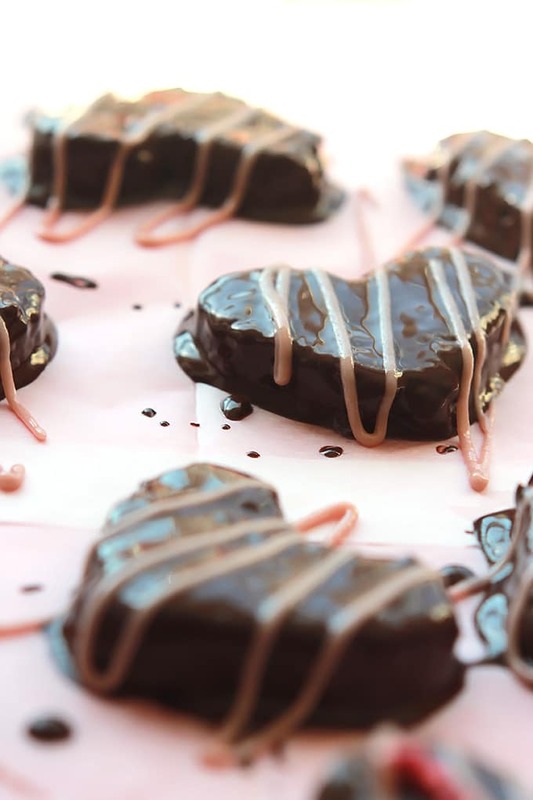 Hazelnuts, dates, and dark chocolate hearts, covered in more smooth creamy dark chocolate, drizzled with raspberry cream. Yum! 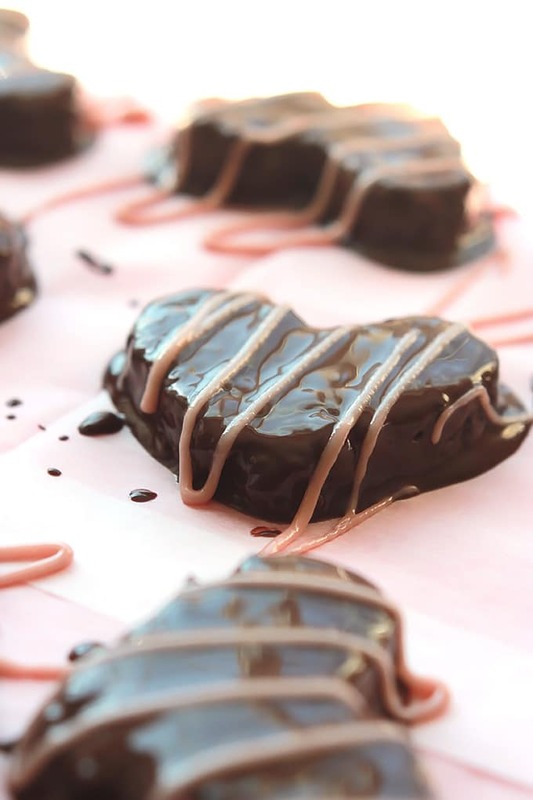 Make these Chocolate Hazelnut Hearts for someone special, even if that someone special is you. I don’t eat a lot of candy, but one of my favorites is Ferrero Rocher, the combination of hazelnut and chocolate is so indulging. This is a slightly different combination of hazelnut and chocolate. Whenever I get candy on Valentine’s Day I always want to get the candy with the nuts, Well this one is full of nuts, one of my favorites, hazelnuts. I try to always keep thing simple, so this is another easy one for you. I started with my basic energy bites ingredients, nuts and dates, adding the chocolate inside and out. Like any other recipe if you want to change the nut, you can switch out for your favorite. 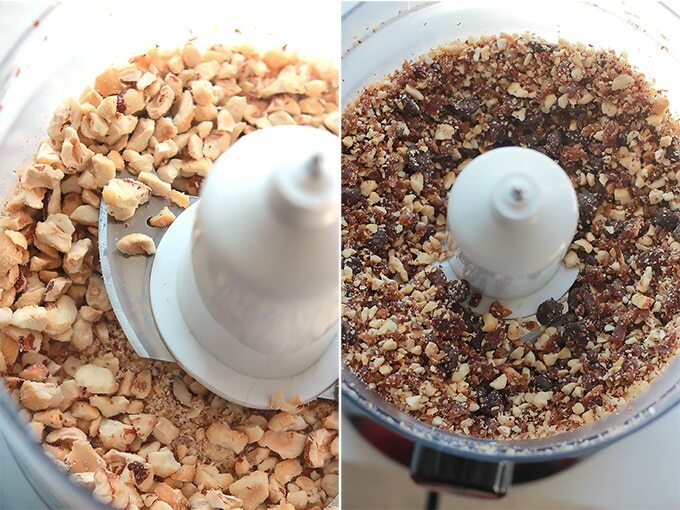 You’ll process the nuts first, next you’ll add in the dates, chocolate chips, coconut oil, and vanilla process until it resembles a coarse meal. It should stick together when pressed between your fingers. If I doesn’t just add in a small, very small amount of water and pulse a few times. How easy is that! When it was time to cover the outside of the candy I used a higher quality chocolate like Scharffen Berger. I wanted to keep everything all natural, so I used a seedless raspberry jam, mixed with a powdered evaporated cane sugar to make the piping glaze. I enjoyed making and eating this recipe. I hope you give this one a try and have as much fun as I did. 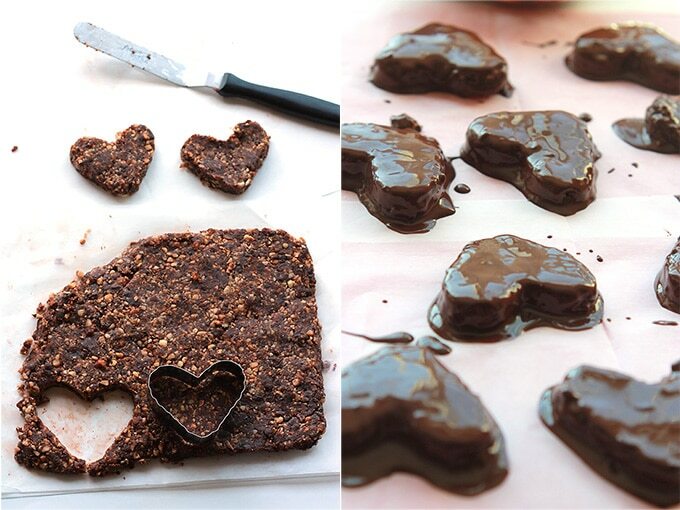 Go make some Chocolate Hazelnut Hearts for your sweetheart! These look addictive, and from the sound of the recipe I know they are. I just love dates! They are addictive Christina, it’s so hard to stop eating them. It’s nice to meet another date lover. 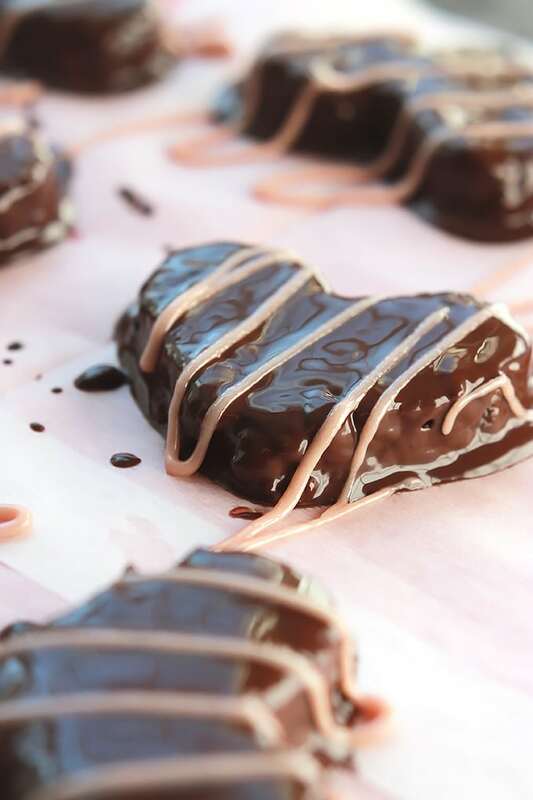 Hi Celeste, These chocolate hazelnut hearts are positively mouthwatering! I would probably want to eat the whole batch! Thank you for sharing this yummy recipe on the Healthy, Happy, Green & Natural Party” Blog Hop! I appreciate it! Thanks Deborah, I hope you have a chance to give these a try, they are so delicious and yes, you will need lots of willpower to not eat the whole batch. Celeste, these are absolutely beautiful and I love that they are vegan too! You’ve inspired me to get baking tomorrow! Thanks Lucie, I’m glad I’ve inspired you. Have fun making these and enjoy! They are and let me warn you, it’s hard to stop eating them. These look delicious! 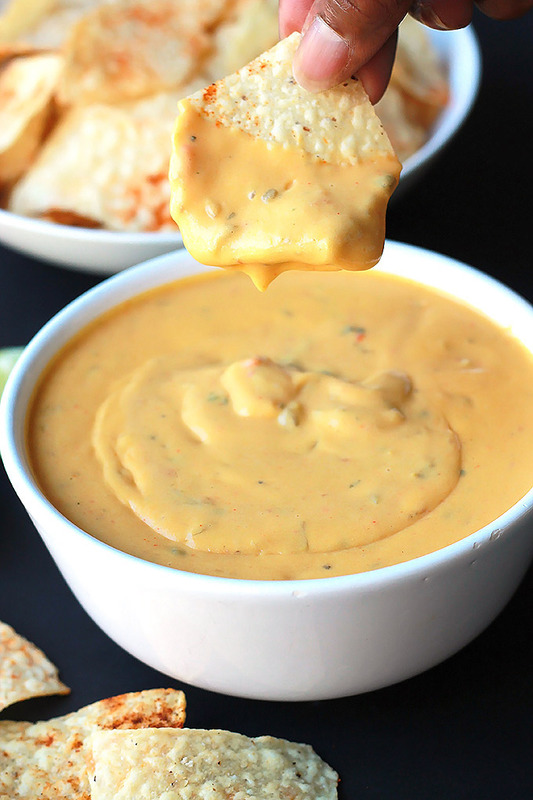 I could totally make these right now! That’s what so nice about this. It’s so easy. Really loving this! Looks like the perfect treat that is just enough sweetness. I like sweet, but not too sweet. Wow these look so amazing! Can’t wait to try them! These look and sound marvelous! Thanks Mary, these are truly marvelous! Yum! What a delicious looking treat, and perfect for Valentines day too. Thanks Jed, I hope you try this! It would appear that your cook book is way past due! Your recipes are so enticing and your photography so pretty…get busy and get that cook book proposal in the mail. This recipe had me at dates plus hazelnuts plus chocolate. Um…delicious. Thanks for sharing and looking forward to seeing that cookbook soon. Funny you say that, I’m working on a mini ecookbook for the blog as a give-a-way. Thanks Rebecca, I hope you have a chance to make this for your Valentine, and I hope your Valentine loves it. 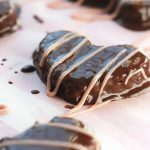 You will love these, there is dark chocolate inside and out. Those look really good! Perfect treat for Valentine’s Day. Too bad I can’t have treats right now! Hopefully you’ll have a chance to try these when you can have treats again. It’s not to bad, as long as you don’t eat them all at once. But I’ll warn you it’s hard to eat just one. I wish I could give you some through my computer, I have a batch in front of me and it’s so hard not to eat every last one of them. Oh my gosh that looks delicious! I think I could probably eat the entire pan of them! 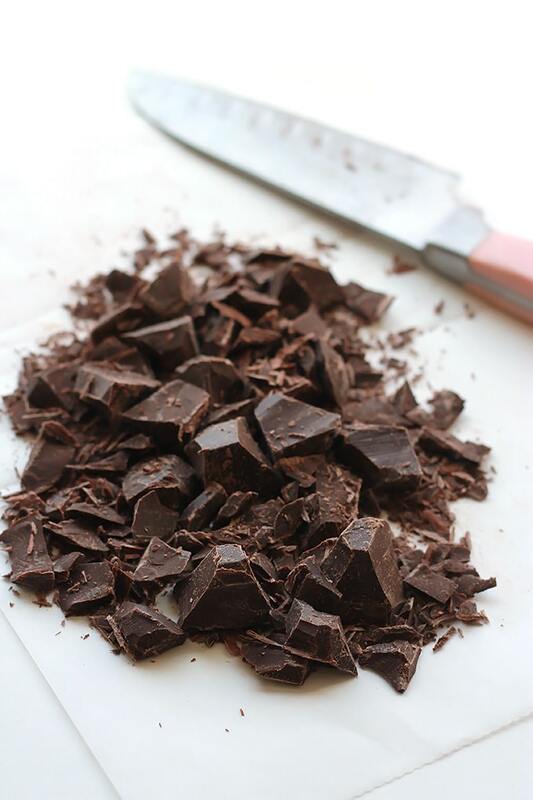 Chocolate and hazelnut is one of my favorite combinations! It took a lot of willpower for me not to eat the entire pan myself. Thanks Christine for visiting, and have a Happy Valentine’s Day! Wow this is so yummy! And perfect timing with Valentines right around the corner. May try this with the kids this weekend. Thanks for the great and easy recipe! Your kids will love cutting out the hearts as much as they’ll love eating them. Have fun and have a Happy Valentine’s Day! These look amazing! 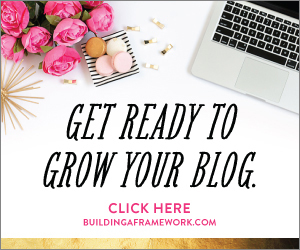 So happy to have found you through Thursday Favorite Thing blog hop. I’m glad you found me Sandra, and I’m glad you found something you like. Hopefully you’ll get to try them soon. I feel the same way about candy as you do, unless it’s filled with hazelnuts and another of my favorites, coconut. Which by the way can be added to this recipe. I hope you have a chance to try these goodies real soon. Well don’t these look like a chocolate little piece of heaven. I too am not a huge fan of candy…especially since being on the healthy track since the start of the year but I will be adding these beauties to my baking pinterest board. I am visiting from #manicmondays. Hi Trista, I’m glad you have found something you can have occasionally that won’t ruin your healthy track. The great thing about these goodies is that there is no baking required. Hi Shari, I’m glad yo found me. I hope you have a chance to enjoy this soon. Oh my! How delicious. Drooling on my keyboard. Ha Ha, Thanks Pamela. They are pretty delicious, hope you give them a try. Yes oh yes please!!!!!!!!!!!!!!!! Thanks for sharing with us at Weekend Potluck. Please come back again soon. They are yummy! I’ll be back to your party next week, thanks for hosting.By the way what time does your party go live? Oh my, I have never had hazelnut hot chocolate, I will have to give it a try.I hope you like these. Yum! These look amazing – I’m very picky about my chocolate and sweets… if I’m going to eat the calories I want to enjoy them! I might have to give these a shot. I feel the same way Marissa, Enjoy! What a special Valentine Treat, your Chocolate Hazelnut Hearts looks delicious. Hope you have a very special Valentine Day and thanks so much for sharing with Full Plate Thursday. Thanks Miz Helen, Happy Valentine’s Day!!! These look amazingly delicious Celeste! I love chocolate and hazelnut too but I also love the raspberry creme. I love raspberries. They look divine! Thanks so much for sharing with #manicmonday I’m definitely sharing this! I’m sure there are many others out there who would love these! Have a super Happy Valentine’s Day weekend. These look absolutely amazing! I’m not a big candy maker, but this makes me want to try. 🙂 I’m pinning this one! Thank you! Thanks Wendy, I hope you give this a try. Happy Valentine’s Day! Will you be mine? LOL I want a bite of one of these gorgeous hearts, actually, more than one, but I don’t want to appear greedy! LOL I love the ingredients and how much fun you have with your food! Pinned and Yummed, I want to try these, make them for those I love too!!! They look so pretty! I bet that are super good, to boot! You make it look so easy! But i love both hazelnuts and chocolate, so this recipe goes on my list. Thanks so much for sharing! They are delicious and hard to stop eating. O my! I never eat junk food, but these look amazing! Thanks so much for sharing and for linking up with The Alder Collective! Hope to see you again this week! I consider this my candied energy bite. The natural sugar from the dates and the protein from the nuts gives me what I need form my running workouts.